PAW Patrol Sea Patroller Review – The favorite pups from Nick Jr. can now be entertaining for your children anytime with the PAW Patrol Sea Patroller playset. 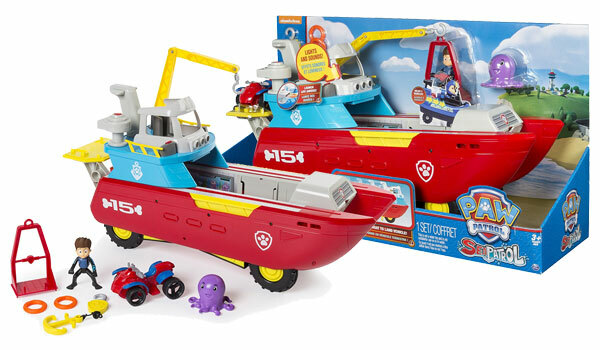 Your little ones can join Ryder on his many adventures with this ship-and-land-vehicle! Drop down wheels pop out from the bottom of the Sea Patroller when the bridge is slid forward. Don’t forget to drop the anchor when you are ready to get off the boat! You can attach the anchor to the side or back, depending on where you want it positioned during play. While it’s fun to play with around water, the PAW Patrol Sea Patroller is not waterproof – so it can’t be submerged – nor will it float. This just means your children must use their imaginations in order to complete missions on land and sea! Attach the cage to the moveable crane to remove Ryder from dangerous predicaments. He can also leave the ship to explore the land on his ATV by dropping the hatch so he can roll out. When he’s not driving around on it, the ATV can be stored on its special dock at the rear of the ship. An octopus and two lifesaving rings are included with the Sea Patroller. Imagine that the baby octopus is trapped in the ocean and needs Ryder’s help. Push one of the life preservers into the launcher and send it out to the marine animal in distress! 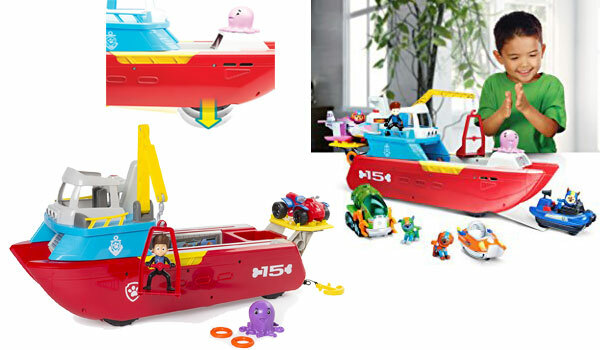 Spacious and roomy, the PAW Patrol Sea Patroller has storage space for other vehicles that the pups use on their missions. 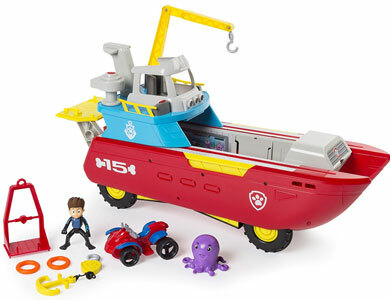 These are sold separately, but look for the Sea Patroller characters and their vehicles to give your children the ones that match the theme of this toy. This makes the patroller a great storage bin for other toys when not in use. It’s also fun to put all the pups on board and let them ride the imaginary waves with their helpful vehicles on deck in case danger strikes. With the PAW Patrol Sea Patroller, your child can actively engage his imagination in hours of fun play. He will also be building his character skills, particularly empathy and compassion. He needs to help Ryder and the PAW Patrol save the octopus at any moment!